It's hard to call a beer "underrated" when its actually held in pretty high regards in terms of its style. 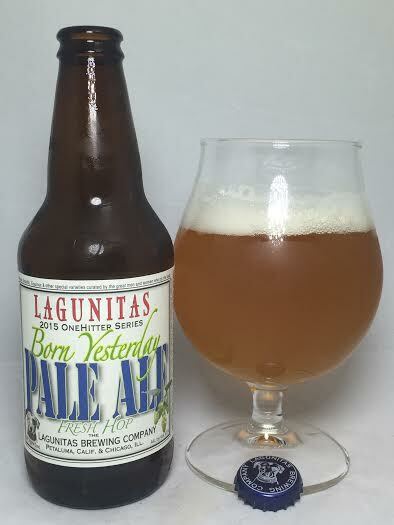 That's how I would describe Lagunitas Born Yesterday Pale Ale. It is something that I personally had never sought out or heard people talking about as much as other offerings from smaller microbreweries, but what we have here is a pale ale that holds its own and surpasses many others in its weight class. Pours hazy for the most part and sits a brilliant orange in the glass with a finger of fluffy white head. This has a bitter and minty aroma with grass and just enough pineapple and mango to keep you interested. An interesting orange sherbet smell shines as this warms up. Woah now, the taste has actually dropped most of the bitterness and now the fruit juices are taking over. Both citrus and tropical fruits are represented with big pineapple and grapefruit. Orange juice and pulp follow next as does some white grape. After it passes the middle, the end transitions to some slight wet grass, but a dash of pine and a dank finish add new elements to a style that doesn't see too much complexity. Mouthfeel is full-bodied with no alcohol presence. There's good amounts of carbonation to help pass everything through the mouth and it just drinks so easily. In the world of pale ales, Born Yesterday is surprisingly complex for the style and is super drinkable. I think with everyone chasing down hard-to-get pale ales from smaller breweries, this gem gets lost in the shuffle, but it deserves to be mentioned in the conversation with some of the highest-rated of its kind. Truly Rhombus!